Because everyone has different needs, we have created several ConstructionBasics� Suites for you to choose from. This page provides information about each specialized suite to help you make the choice that is best for you. Each version has been designed to meet the needs of a specific field of construction and includes specialized tools, templates and spreadsheets to streamline project management, accelerate the construction process and limit your liability. UDA BuildingBasics� is designed to provide Construction Management, Estimating and Productivity Tools for Homeowners and Do-It-Yourselfers who are building a home or hiring a contractor. With expert Contracts, Forms, Specifications, Worksheets and Estimating Templates designed to accomplish criitcal tasks more efficiently, UDA BuildingBasics is powerful software you can use right now to save time, save money and limit your liabilty. Learn more about BuildingBasics�. UDA RemodelingBasics� provides Construction Management, Estimating and Productivity Tools for Homeowners and Do-It-Yourselfers who are remodeling a home or hiring a contractor. With expert Remodeling Contracts, Forms, Specifications, Worksheets and Remodeling Estimating Templates designed to accomplish critical tasks more efficiently, UDA RemodelingBasics� is powerful software you can use right now to save time, save money and limit your liabilty. Learn more about RemodelingBasics�. UDA DesigningBasics� provides Planning, Design, Construction Management, Estimating and Productivity Tools for Homeowners and Do-It-Yourselfers who are designing their own home or home addition. Includes the Home Planning Guide, Construction Specifications, Detailed Notes for Construction Documents, Worksheets and Estimating Templates designed to assist Individuals plan, design, document, bid and budget most residential and remodeling projects. Learn more about DesigningBasics�. 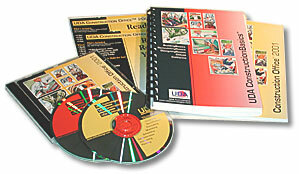 UDA ConstructionBasics� Deluxe combines the specialized tools and features of the BuildingBasics, RemodelingBasics and DesigningBasics Versions, including Construction and Remodeling Contracts, Forms, Specifications, Planning Tools, Worksheets, Estimating and Accounting Templates for Homeowners and Do-It-Yourselfers who are building, remodeling or designing their own home or hiring a contractor. Learn more about ConstructionBasics� Deluxe. Order UDA ConstructionBasics� Deluxe online. UDA ConstructionBasics� California provides Construction Management, Estimating and Productivity Tools for Homeowners and Do-It-Yourselfers in California. With New Construction and Remodeling / Home Improvement Contracts, Forms, Specifications, Worksheets and Estimating Templates designed to meet California's Contractors State License Board requirements and accomplish critical tasks more efficiently, UDA ConstructionBasics� California is simple but powerful software you can use right now to save time, save money and limit your liability. Learn more about ConstructionBasics� California. Order UDA ConstructionBasics� California online. Part of our Professional Line of ConstructionOffice� Software, UDA ConstructionOffice� Homeowner is designed for Homeowners and Do-It-Yourselfers who are building their own home or hiring a contractor. Includes comprehensive Construction Management Tools, Guidelines, Estimating, Budgets, over 350 pages of understandable Construction Contracts, Forms, Specifications, Worksheets and Estimating Templates for residental construction. Learn more about ConstructionOffice� Homeowner versions. Your success is our goal! We're so confident that UDA ConstructionBasics� Software will help you succeed, we offer a 10-Day Money Back Satisfaction Guarantee.